Do you miss having bagels as much as I do? I admit to being a former bread addict and bagels are a weakness of mine. 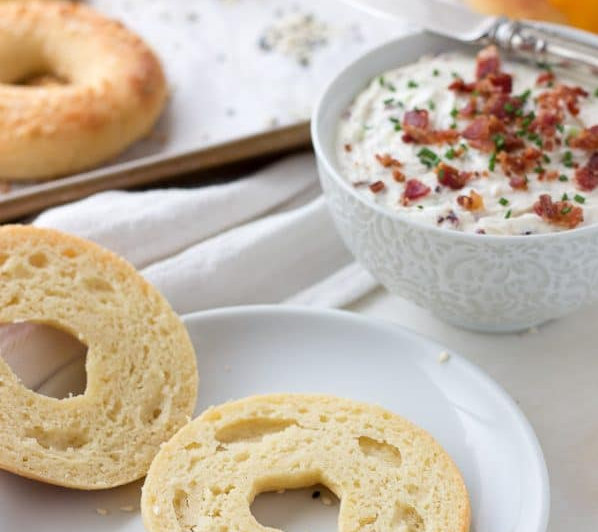 Sesame bagels are a favorite, especially with bacon and scallion cream cheese like Bruegger’s Bagels makes. Mmmm. But sometimes, I enjoy my bagel toasted and slathered in butter and sugar-free jam; my favorites are strawberry, raspberry and blueberry. 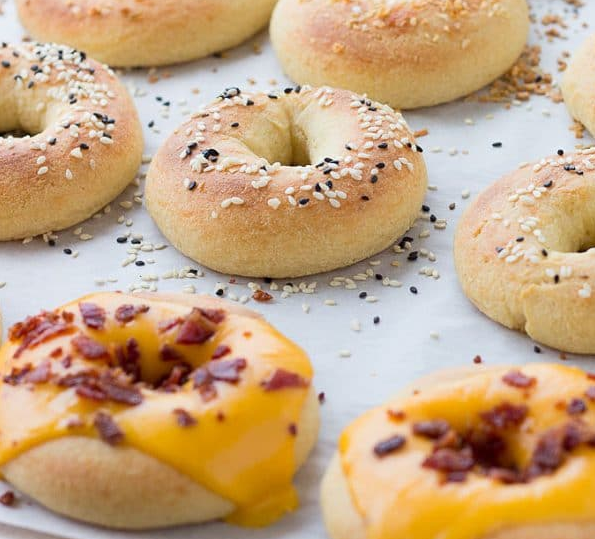 A blogger friend, Maya from WholesomeYum, recently posted a recipe for bagels using the fathead pizza crust recipe. Imagine healthy low carb bagels made with almond flour and mozzarella cheese! As you probably know, we low carb bloggers use this simple mozzarella dough recipe for almost everything. It’s a forgiving recipe accepting tweaks of all kinds for both sweet and savory applications – like bagel dogs. I’ve tested this low carb keto bagel recipe extensively the last several weeks and finally have the recipe and technique down. Don’t worry. The recipe is extremely easy. I test my recipes several times before sharing. You only need five ingredients to make great low carb bagels but adding a sixth ingredient makes them even better. The simple ingredients are found in almost all low carb homes. The dough is made with mozzarella cheese, cream cheese, almond flour, baking soda (or baking powder) and an egg.Adding a little protein powder or oat fiber makes the bagels even more bread-like. 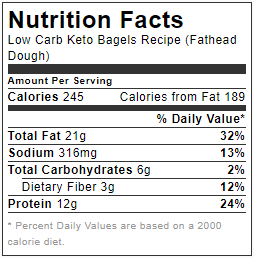 HOW TO MAKE LOW CARB BAGELS? The method for making the bagel dough is very easy. I’ve experimented with three techniques and have a favorite. However, I will share all three with you since I want this recipe accessible for everyone. Hand Method: Melt the cheeses together in the microwave (or on the stove). Add the egg and stir until combined. Add the almond flour and baking powder and stir to combine. Mix the dough thoroughly. It is very sticky, but easier to handle when it is cool and your hands are oiled. Lightly oil hands, divide the dough into even portions and roll into snakes and make a circle by pinching the ends together. Bake on a parchment lined cookie sheet. Food Processor Method: This is my favorite method. Melt the cheeses together in the microwave (or on the stove). Scrape the melted cheese into the bowl of a food processor and pulse a few times. Add the egg and run on low until completely incorporated. Add the almond flour and baking powder and mix to form a nice dough. Scrape onto a piece of cling wrap and freeze until the oven is ready. Lightly oil hands, portion dough and roll into snakes and make a circle by pinching the ends together. Bake on a parchment lined cookie sheet. See? Super easy! No need for special doughnut pans or equipment. You can enjoy healthy low carb bagels in minutes. I make a batch of low carb bagels on the weekend and enjoy them as a breakfast sandwich or with cold cuts for lunch. They make a great low carb and gluten-free bread alternative. NOTE: These do not have the characteristic “chew” of real NY wheat flour bagels. 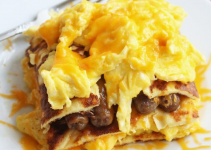 This is a low carb recipe using low carb ingredients. However, it is a nice sub for those who are missing bread. Follow the recipe as written for low carb bagels but sub ground sunflower seeds for almond flour or 3/4 cup of ground golden flax seeds. The bagels made with sunflower seeds may turn green, but that is only cosmetic. [NOTE:] I’ve had readers tell me that using Daiya dairy-free cheese and dairy-free cream cheese works in this recipe. 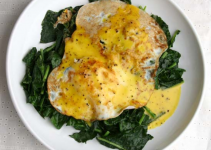 Readers have also told me that they have had success with using a flax egg for an egg-free recipe. I have NOT personally tested these ingredients. An easy low carb keto bagels recipe with fathead dough which results in perfect keto bagels every time. Have bagels ready in minutes for your next breakfast or lunch. Place the mozzarella cheese and cream cheese in a microwave safe bowl and microwave for 1 minute. Stir and microwave for 30 seconds to 1 minute more. Scrape the cheese into a food processor with the egg and process until smooth. Add the dry ingredients and process until a dough forms. It is very sticky! Scrape onto a piece of cling film and place into the freezer. Preheat oven to 400 F and place rack into the middle of the oven. Line a baking sheet with parchment. When oven is ready, remove the bagel dough from the freezer and divide into 6 equal pieces. Lightly oil hands and roll each portion into a snake and seal the ends together forming a ring. Place on the parchment paper and top with your favorite topping, pressing gently to adhere. Bake for 12 minutes or until the outside has browned. They will still be soft, so let them cool before removing from the baking sheet. Once cool, store in a bag in the refrigerator. Warm slightly to enjoy or toast. Keep bagels in the refrigerator in an airtight container. They keep for 7-10 days and also freeze well. 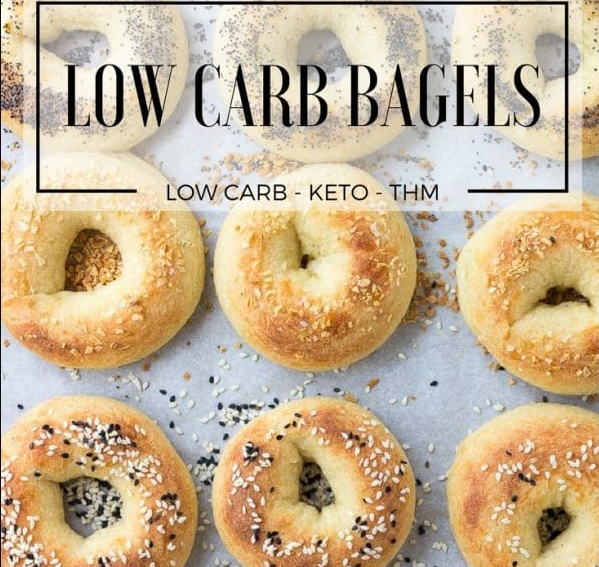 This is a low carb recipe and these do not have the chew of a real bagel. However, they are a great sub for those missing bread. *The oat fiber option tastes the best, but use what you have. The texture is more biscuity. The protein powder gives a very nice texture if you decide that route. **If your bagels flatten out while baking try adding 2 tablespoons – 1/4 cup more almond flour. Also try the baker’s trick of preheating a metal pan in the bottom of the oven and tossing ice cubes into it when the bagels go into the oven. The steam will force the bagels to rise. Don’t remove the bagels from the pan until they cool a bit. ***If your dough is luke warm to the touch after mixing, it does not need to go into the freezer to cool. Do NOT double the recipe if making in the food processor or it will crawl up under the blade. Mine was difficult to clean out completely. 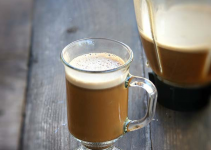 Herbal Coffee Bulletproof: A Caffeine-Free Treat! Keto Side Dishes Copyright © 2019.